Knowledge workers of the world, listen up! Logitech wants to solve your headphone problem. Actually, make that your headphones problem: The upcoming Logitech Wireless Zone headphones could replace the three types of headsets currently cluttering your desk in that oh-so-trendy open office. Logitech’s pitch is that Zone Wireless will free you from juggling your omnipresent earbuds, the cushy noise-canceling headphones you brought from home, and that ugly headset your company’s IT department burdened you with. 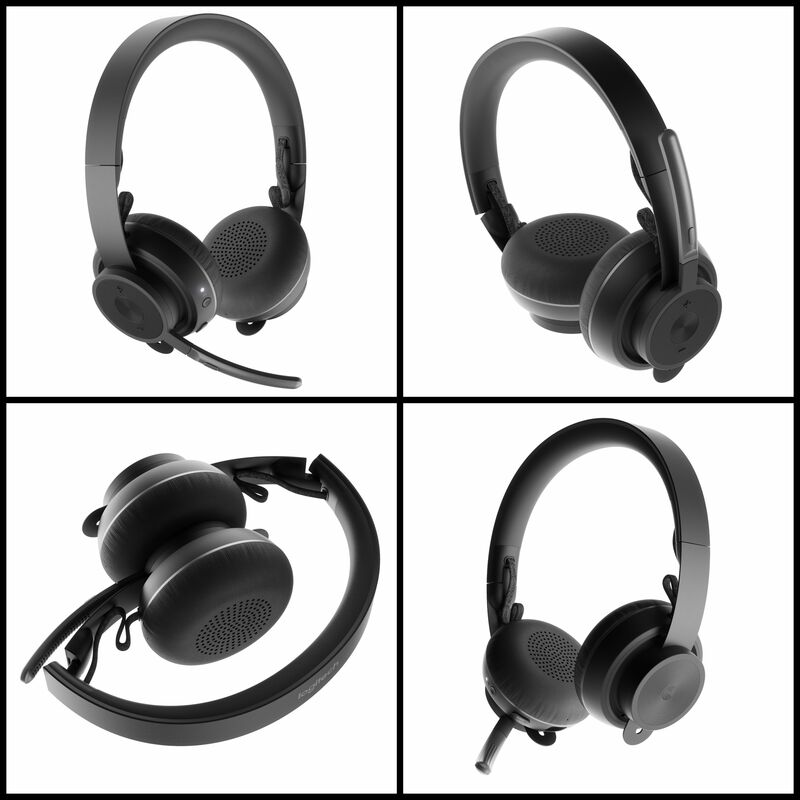 During a prelaunch demo in San Francisco, Logitech showed off the over-ear headphones’ mix of compelling features. Zone Wireless packs active noise cancellation as well as Qi wireless charging, which Logitech says is a first for headsets. They work with Bluetooth or one of Logitech’s bulletproof Bluetooth dongles. And all that juicy tech goodness comes in a smart-looking package. Padded leatherette ear cups scream “all-day comfort.” An unobtrusive noise-canceling microphone flips down when you need to talk. And a sleek, silicone headband, which slides through the earpieces rather than adjusting on top of the skull, means Zone Wireless don’t look dorky like that despised company headset. You also can control the headphones’ functions using the app. Or you can use physical controls on the Zone Wireless ear pads. A big, fat center button on one side lets you pause music, take calls, etc. The idea for Zone Wireless was to create stylish headphones that look and sound professional enough for an office environment, Logitech says. The headphones also might save today’s “mobile first” worker bees from some indignities of the modern office. During the demo, Logitech offered a taste of how the Zone headphones will function in a workplace fitted with huddle rooms and lounge areas but precious little private personal space. Switching from music to a live call proved simple. And the app’s straightforward controls made it easy to customize the audio. While developing Zone Wireless, Logitech researched the needs of modern workers. People frequently hop from video calls at their desks (using that no-nonsense IT headset) to calls on their personal smartphones (using AirPods or other earbuds). Then they pop on a pair of over-ear headphones by Beats or Bose to listen to tunes while concentrating on individual tasks. Those padded headphones help blot out the noise of the typical open floor plan. They also offer a bit of respite from gabby co-workers. Then, Logitech set out to create a Bluetooth headset designed for the open-floor-plan offices favored by tech geniuses who never actually worked in one. Zone Wireless’ active noise cancellation blocks out distractions. And the Logitech app lets you dial in as much ambient noise as you might need while making calls. This makes your voice sound much more natural inside your head. It also could stop you from being that person who barks obliviously into their headset during a call or videoconference. Speaking of call quality, Logitech employed a dual MEMS microphone array for optimal call quality. During calls, an algorithm strips out background noise. Zone Wireless launches this month, with the Zone Wireless Plus coming in June, Logitech says. Look for a full review from Cult of Mac once demo units ship. You can read Logitech’s Zone Wireless press release below. Zone Wireless headphones fold up for easier stowing, and the mic flips up when when you’re not using it. charging at the user’s desk. Zone Wireless is Certified for Skype for Business and approved for Microsoft Teams. Logitech has worked closely with our Collaboration Partners including Google Cloud, Zoom, Fuze, Unify, TrueConf, and StarLeaf to ensure a seamless user experience. Zone Wireless will also support some of the most popular collaboration, conferencing and voice applications like Bluejeans, Cisco WebEx, Cisco Jabber, and GoToMeeting. Both models will be available for purchase globally through Logitech’s authorized reseller network and via Logitech.com. When Logitech Zone Wireless is combined with Logitech BRIO, it provides a total video and audio solution for your desktop. Additionally, Zone + webcam bundles will be available in selected channels. Logitech designs products that have an everyday place in people’s lives, connecting them to the digital experiences they care about. More than 35 years ago, Logitech started connecting people through computers, and now it’s a multi-brand company designing products that bring people together through music, gaming, video and computing. Brands of Logitech include Logitech, Ultimate Ears, Jaybird, Blue Microphones, ASTRO Gaming and Logitech G.
Founded in 1981, and headquartered in Lausanne, Switzerland, Logitech International is a Swiss public company listed on the SIX Swiss Exchange (LOGN) and on the Nasdaq Global Select Market (LOGI).